Watching turtles is a little frustrating. Although there’s a large variety in India, there are few guidebooks or websites which tell you how to identify what you saw. We stopped to see a few of these large turtles on our first sortie into Kaziranga. I didn’t know what they were when I took the featured photo. I have a tentative identification of it being the Indian black turtle (Melanochelys trijuga) through its size and colour. The hind edge of the shell is deeply serrated, as you can see. I’m sure that this should be an aid in identification, but it does not seem to be mentioned in any guide. If it is indeed the Indian black turtle, then it is near-threatened. This means that it could still be fairly common inside a sanctuary, so there is a good chance that this is what I saw. But you can always fool yourself. 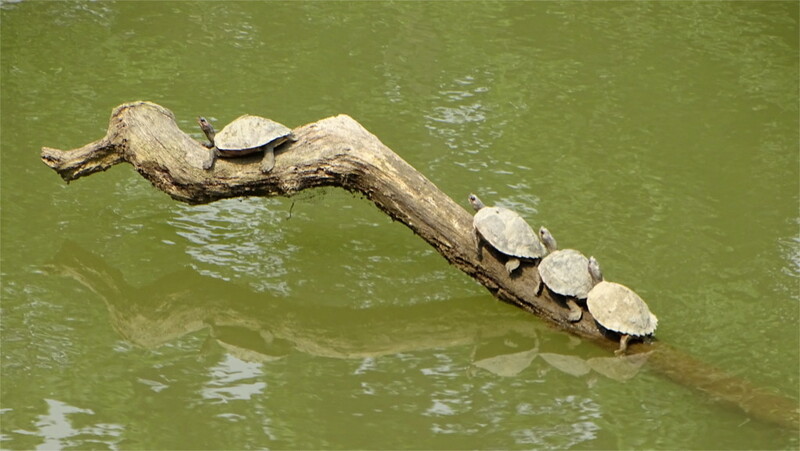 The common Indian roofed turtles (Pangshura tecta) are relatively small turtles which love to climb out of the water and bask in the sun. It took me some time to decide whether the photos above are of P. tecta or the endangered Assam roofed turtles (Pangshura sylhetensis). Both are found in forest streams. The reptile database is pretty useless as an identification tool because its photos are not curated by experts. Eventually it was Wikipedia which convinced me that I’d seen the rarer variety. The article on P. sylhetensis says that its shell is serrated at the hind edge, as these are. The upper shell of this species is also darker. It is so nice to be able to see an endangered species that you want to believe that you have. So I’ll have to wait a little longer for some experts to tell me whether or not I have. Given the rarity of P. sylhetensis, (the IUCN page claims that only a few specimens have ever been seen) the chances are that I’m fooling myself. My introduction to nature came first through the stories by Jim Corbett. These would often feature him sitting in a hide with a goat tied nearby as a lure for tigers. Seeing a goat at an entrance to Kaziranga, I was reminded of this. The gate was an elaborate affair. We counted off what we’d seen already: rhinos, elephants and wild water buffalo were three of the “big five” here. The gate also showed the elusive swamp deer, barasingha. We had only a little glimpse of one on this trip. Pelicans, shown in flight around the gate posts and holding the sign, are not usually counted among the main attractions. But where was the real big one: the tiger? It made a brief and almost unnoticed entrance at the bottom of a signboard full of the rules which bind you and protect the forest. 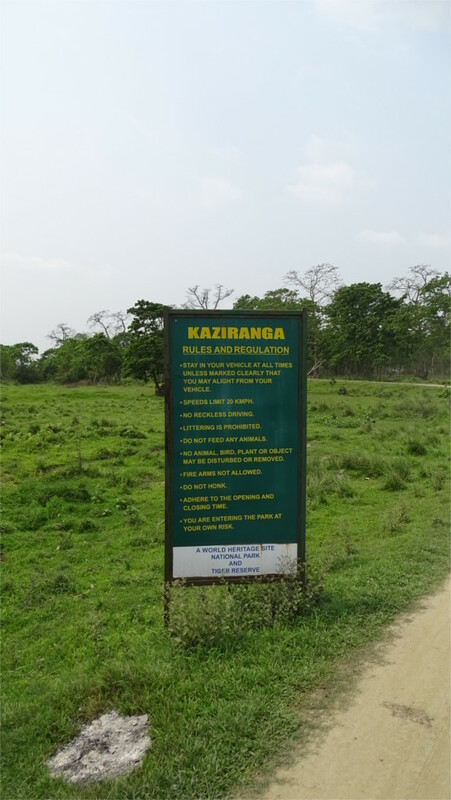 If you don’t stand there and read the whole thing you may miss the fact that Kaziranga is also a tiger reserve. In fact it has the highest density of tigers in the world, but they are seldom spotted because of the tall grass that they can hide in. The goat was only a decoy, after all. The central zone had a less impressive gate: just a boom which could be raised or lowered. But I liked the owls which showed the opening and closing times for visitors. We never did get to see the tiger, but we saw so much here that I didn’t regret the trip at all. A crested serpent eagle (Spilornis cheela) sat in a branch of a tree which arched over the track our jeep was on. 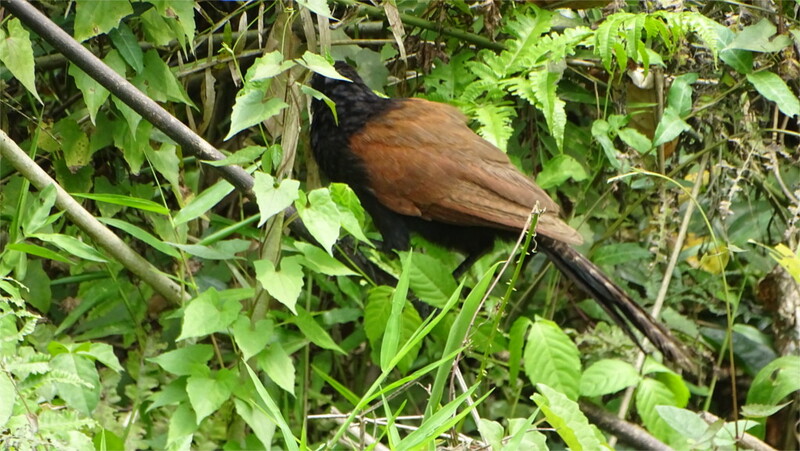 We stopped a distance away and examined the bird. S. cheela is widespread and not uncommon, but one always stops to pay our respect to this hunter. The black crest gives it a hooded appearance, and the streaked and spotted feathers look good in sunlight. It was midmorning, so it must have fed already, but it was on the lookout for some tidbits. It perches on trees until it sees prey, then swoops down to pick it up. It looked at us, and decided that we were neither food nor a threat. It ignored us completely after that. Our jeep could then creep forward until we were directly below it, and I could take the odd angled photo that you see here. I’ve never seen one eating a snake, although that is their main prey. Occasionally I’ve seen one with a large lizard. Author I. J. KhanewalaPosted on May 8, 2018 May 6, 2018 Categories India, WildlifeTags Assam, crested serpent eagle, Kaziranga National Forest, Spilornis cheelaLeave a comment on You are not food! Wildlife watching is frustrating. There are times when the light is just brilliant, the air is particularly clear, and you can see tiny details on branches of far away trees; but there are no birds to be seen. This was such an unfortunate afternoon. We drove out into Kaziranga for our last outing of the trip. The Family was feeling a little ill, and decided to stay in bed. The morning’s haze had disappeared, and the air was cool. Golden light seemed to drip over the whole jungle. The only thing visible was the Indian roller (Coracias benghalensis) which you see in the featured photo. The roller is a beautiful bird, but you can see it outside of cities very easily. Strangely, I don’t have a good photo, so I take every opportunity to take one. It had light behind it, and the tail was covered, but the colours came out pretty clearly. 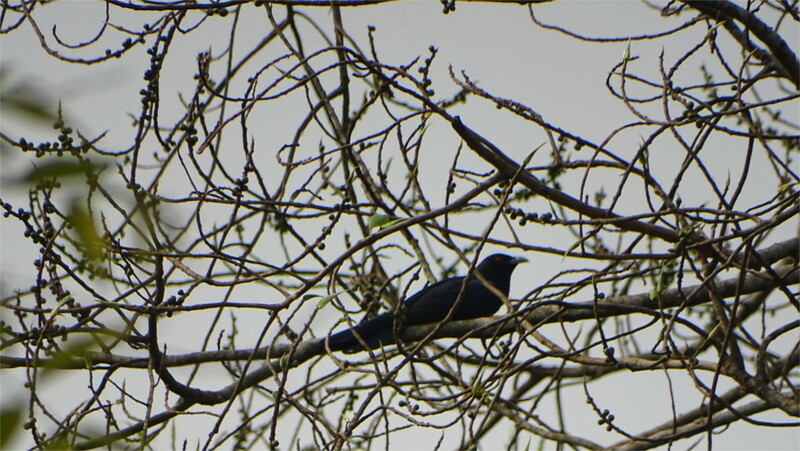 If it had decided to sit on the other side of the trail, then in the better light you would be able to see the lilac feathers in the throat more clearly. You need to peer at the photo rather closely to notice that there is a change in colour between the breast and neck. What you can see very clearly are the talons. The bird sat quietly. It wasn’t interested in giving us a demonstration of the wonderful acrobatics which it gets its name from. We were in the middle of the breeding season, so perhaps it had found a mate. But there was no nest in sight. We moved on through the seemingly empty jungle. 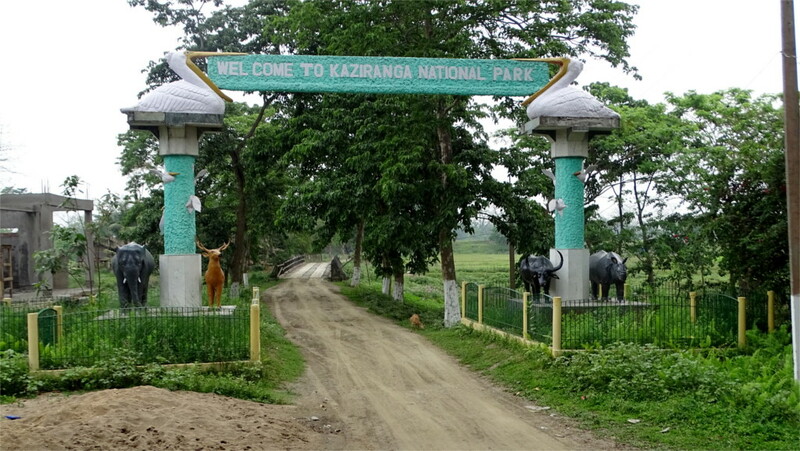 Kaziranga is a star when it comes to wildlife conservation. The number of endangered and vulnerable species which we saw in two days is a testament to its success. So is the fact that it has been an UNESCO world heritage site for over 30 years. As a result, I was intrigued when I saw reports on it in The Telegraph, The Times of India and Scroll. 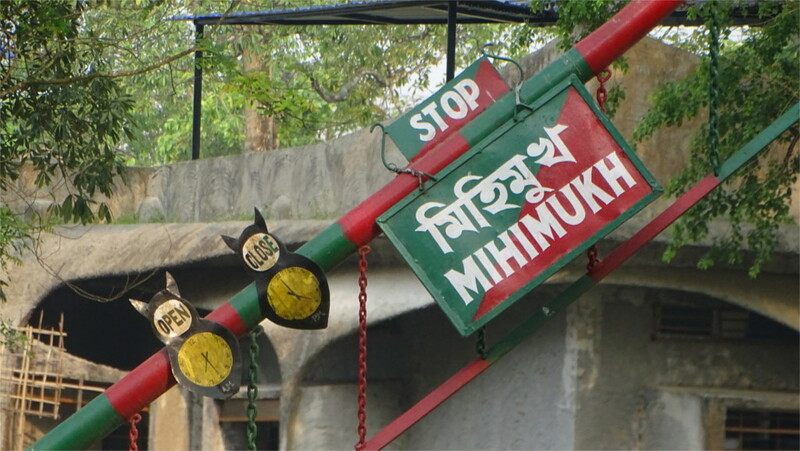 It seems that the union government’s plan to give over management of the park to a private company, is unacceptable to locals as well as to the state government. 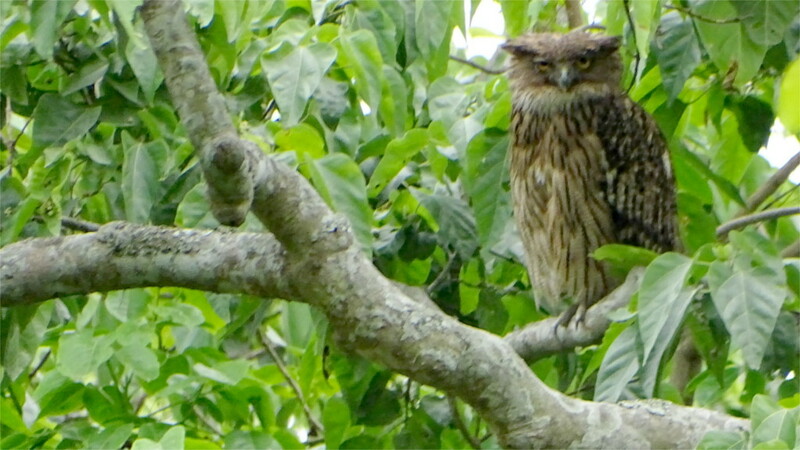 In our recent visit to Kaziranga, we saw enormous involvement of locals in the sanctuary. It wasn’t just the hospitality industry. A drawing competition in a school was dedicated to wildlife. Advertisements branded themselves by the local animals. Some of the drivers were wonderful wildlife guides. Social involvement in the refuge seems very deep. I can understand the consternation about handing stewardship of the park and tourist facilities over to a single company. A trip through Kaziranga is both exciting and sad. In the short period of two days I was excited by the fact that I could photograph and see so many different species. Sadly, many of these were vulnerable and even endangered in the rest of the world. Among the endangered species was the wild water buffalo (Bubalus arnee), whose photos you see above. This is not the same as the domestic species, Bubalus bubalis. During the ice ages, B. arnee roamed over all of Europe and Asia. The dry climate after the ice-ages restricted them India, south and south-east Asia. Now, they are extinct in Bangladesh, Malayasia, Sumatra, Java, Borneo, Laos, Cambodia, and Vietnam. The last refuge of these ancient animals are the sanctuaries of north-eastern India. IUCN accepts counts which may put the current population at about 4000 individuals. Kaziranga counted about 1400 in its last wildlife census. I saw this herd resting in an open meadow in the mid-morning. Luckily, there was a Varuna tree (Crataeva nurvala) in flower just behind them, providing a nice completion to the photo. Like elephants, the herds are led by an older female. 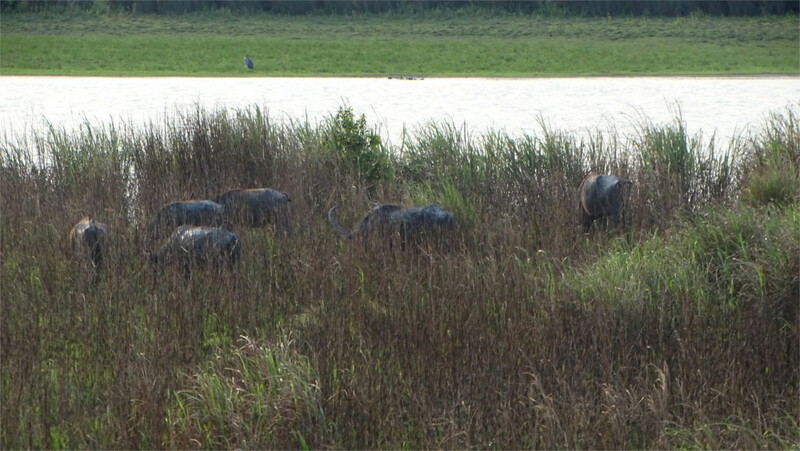 The next day was my last sighting of wild water buffalos. They were busy grazing in a patch of tall grass next to a stream. Flat, well-drained land is their preferred habitat. When I was a child they would still make long journeys across the country. With the urbanization of India, those days are long gone. The photo which you see above captures the sight which remains in my memory: the sun setting finally on herds which evolved in the times of the Mastodon.